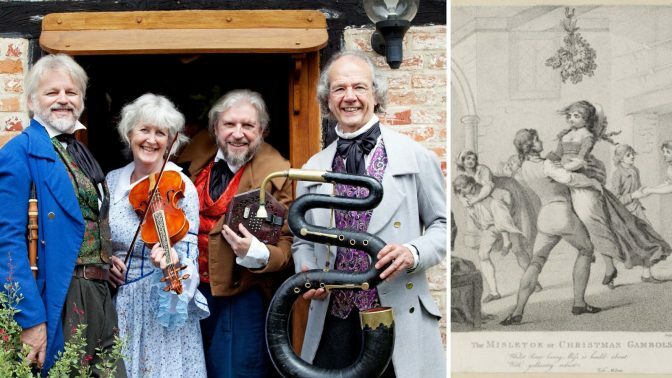 Join us for an evening of dancing, carolling and carousing in English Tradition with songs, tunes and tales from Hardy’s Wessex. The Mellstock Band return to Halsway Manor with a new Christmas and Album. An uproarious celebration of dance, drink and general misbehaviour as carried on at Christmas in many villages until about a hundred years ago – along with sobering admonitions from puritans, parsons and angels. The band perform in period costume with a mix of early and modern instruments. The stories and poems come from Dorset stalwarts Thomas Hardy and William Barnes. Hardy’s family were themselves musicians and collectors of folks song and dance manuscripts. These dance traditions were central to Christmas celebrations alongside the ancillary activities of drinking, singing and revelry. Alongside this are carols dedicated to dancing, bell-ringing and cider, and the Devil’s own tunes, with parsons and preachers caught in the crossfire. The Mellstock Band are running a musicians weekend workshop. Dave Townsend the band’s director and founder. A well-known singer and instrumentalist, and one of the leading researchers in west gallery and village band music. As arranger and composer, he has provided music for film, television, radio and theatre, and for numerous recording projects. He has published books and taught and lectured on many aspects of traditional and early music. Caroline Butler is a singer of wide experience, performing with choirs, madrigal groups and other acapella harmony singing ensembles. She was the lead singer and fiddler with the folk-rock band Jumpleads, and plays with early music group The Oxford Waits and the dance band Geckoes. She has recorded and guested with The Mellstock Band on many occasions, and now takes her place as a regular member. Tim Hill is an inventive wind player and composer whose background performing on clarinet, flute, saxophone and shawm embraces early music, free improvisation, theatrical performance art and mainstream jazz. He runs the contemporary street band Tongues of Fire, and performance groups Rag and Bone and Leviathan Whispers, creating myriad haunting musical and multimedia experiences. Other projects have included Pandaemonium, Noise Eating Monsters and Street Band workshops. Phil Humphries studied at Trinity College, London, and embarked on a career as a big-band trombonist with The Andy Ross Orchestra, which played for the original BBC TV Come Dancing. After returning to his native Dorset, he became involved in early music, and is now one of the country’s leading serpent players. He is a member of The London Serpent Trio and music-hall duo The Lost Chord, and guests regularly with various orchestras on trombone, ophicleide and serpent.